The Irish rugby shirt features the Breathlite 2 layer system; the base layer keeps your skin dry by wicking moisture away while the outer layer keeps your skin cool in hot weather. This Irish rugby jersey is further enhanced with rubber safety buttons and a high-quality construction that enables top durability. This short sleeve Irish rugby shirt features the Live for Rugby design on the right chest along with Ireland boldly embroidered across the front. 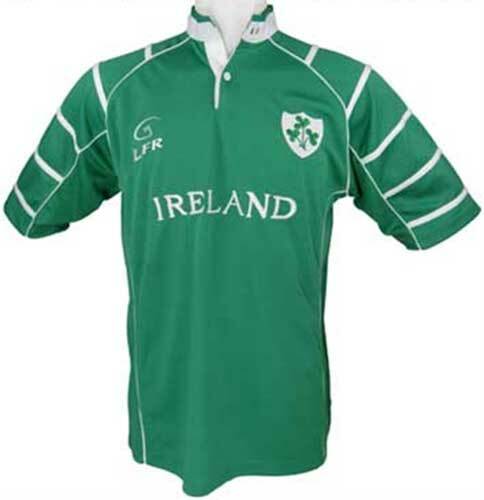 The Kelly green Irish rugby jersey is further enhanced by the shamrock sprig shield on the left chest along with an embroidered tricolor Irish flag on the front collar and a single embroidered green shamrock on the back collar. This traditional rugby shirt is available in sizes adult small through 3XL and it is received with a shamrock history card, complements of The Irish Gift House.